* In contrast to the 2007 National Diabetes Fact Sheet, which used fasting glucose data to estimate undiagnosed diabetes and prediabetes, the 2011 National Diabetes Fact Sheet uses both fasting glucose and A1C levels to derive estimates for undiagnosed diabetes and prediabetes. These tests were chosen because they are most frequently used in clinical practice. Diabetes is a disease that changes the way your body uses sugar. Some of the food you eat turns to sugar. The sugar then travels through the blood to all parts of the body. Usually, insulin helps get sugar from the blood to the body’s cells, where it is used for energy. When you have diabetes, your body has trouble making and/or responding to insulin. So your body does not get the fuel it needs, and your blood sugar stays too high. 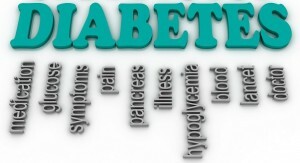 Type 2 Diabetes is a problem with your body that causes blood glucose (sugar) levels to rise higher than normal. This is also called hyperglycemia. Are You At Risk for Type 1 Diabetes? Age. 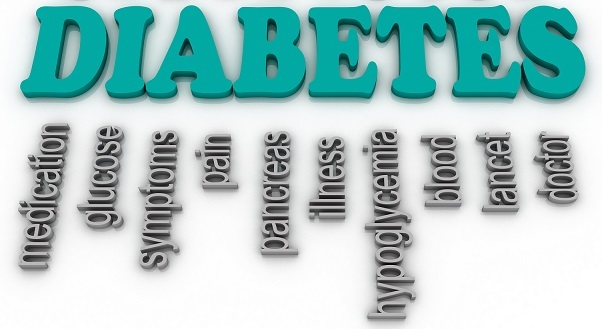 The risk of type 2 diabetes increases as you get older, especially after age 45. That’s probably because people tend to exercise less, lose muscle mass and gain weight as they age. But type 2 diabetes is also increasing dramatically among children, adolescents and younger adults because they are overweight. Women with high risk factor for type 2 diabetes have a greater risk for developing cardiovascular disease (CVD), and the risk increases with age. A postmenopausal woman who has type 2 diabetes is 3 times more likely to develop CVD or stroke and is 4 times more likely to die from a myocardial infarction than a woman without the disease. Women with type 2 diabetes are at increased risk for developing endometrial cancer, colorectal cancer, and a risk of gallstones is doubled. In uncontrolled type 2 diabetes, some women may experience complications that include neuropathy, renal failure, vision loss, or amputation. How Does Someone Know if He/She Has Diabetes? Diagnosing diabetes at an early stage is crucial if you want to avoid the serious complications it causes. Type 1 diabetes testing include the: Glycated hemoglobin (A1C) test. This blood test indicates your average blood sugar level for the past two to three months. It works by measuring the percentage of blood sugar attached to hemoglobin, the oxygen-carrying protein in red blood cells. The higher your blood sugar levels, the more hemoglobin you’ll have with sugar attached. An A1C level of 6.5 percent or higher on two separate tests indicates you have diabetes. The fasting plasma glucose test (FPG) or the oral glucose tolerance test (OGTT). In general, it is recommended that any blood test that is outside the normal range be repeated on a different day to confirm the diagnosis. The American Diabetes Association recommends the FPG because it is easier, faster, and less expensive to perform. The FPG test is a blood test that determines the amount of glucose (sugar) in the blood after an overnight fast (not eating for at least 8 hours). A fasting blood glucose level between 100 and 125 mg/dl means a person has pre-diabetes. A fasting blood glucose level of 126 mg/dl or higher means a person has diabetes. With the OGTT test, a person’s blood glucose level is measured after fasting and then 2 hours after drinking a glucose-rich beverage. 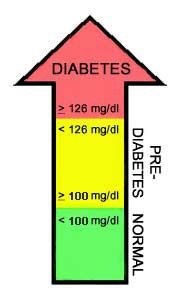 If the 2-hour blood glucose level is between 140 and 199 mg/dl, the person has pre-diabetes. If the 2-hour blood glucose level is at 200 mg/dl or higher, the person has diabetes. See the chart below for the ranges of blood sugar levels and how they are used to diagnose pre-diabetes and diabetes. If you’re diagnosed with diabetes, your doctor will also run blood tests to check for autoantibodies that are common in type 1 diabetes. These tests help your doctor distinguish between type 1 and type 2 diabetes. The presence of ketones — byproducts from the breakdown of fat — in your urine also suggests type 1 diabetes, rather than type 2. Exercise. 30 minutes a day, most days of the week. Take a brisk walk (outside or inside on a treadmill). Take a low-impact aerobics class. Swim or do water aerobic exercises. Ride a stationary bicycle indoors. During your lunch break, walk to do your errands. Good nutrition is a very important part of diabetes management. People with diabetes should work with their diabetes healthcare team to develop an eating plan that meets their personal food preferences while keeping blood glucose in a healthy range. Choose nutritious foods and get plenty of physical activity level. By doing this, blood sugar levels can be kept as close to normal as possible. Eat lots of vegetables and fruits. Try picking from the rainbow of colors available to add variety to your meals. Choose whole grain foods instead of processed grain products like white bread, white rice or regular pasta. Try brown rice with your stir-fry or whole wheat spaghetti with your favorite pasta sauce. Include fish in your meals two to three times a week. Choose lean meats like chicken and turkey without the skin. To prepare meats and fish with less fat, trim any visible fat and use low-fat cooking methods such as broiling, grilling, roasting, poaching or stir-frying. Choose low fat dairy products such as milk, yogurt and cheese (1 percent fat or less). Choose liquid oils such as canola, olive or peanut oil for cooking, instead of solid fats such as butter, lard and shortening. Remember that all fats are high in calories. Choose fruit that is in-season for dessert – you’ll get more flavor and pay less too! Try to cut back on high-calorie dessert and snack foods such as chips, cookies, cakes and ice cream that give you and your family little nutrition. Choose water and calorie-free “diet” drinks instead of regular soda, fruit punch, sweet tea and other sugar-sweetened drinks. Decrease the amount of sugar (if possible stop) adding it to your coffee, teas, etc. Take Your Medicine. It is important for people with diabetes to know what medicines they are taking, why they are taking them and how to take them. People with diabetes should tell their doctor or health care provider if they are taking any herbs or other supplements. Check your Blood Sugar. Your doctor should explain how to test your blood sugar and how often to check it. Lose weight. If you are overweight any reduction in body weight will have beneficial results. Try to bring your weight within a normal range. A1C Blood Test. This blood test measures the average blood sugar over the last three months. It should be done two to four times a year. An A1C measure of less than 7 percent is the goal. Blood Pressure. This should be checked at each visit to a doctor or health care provider. A blood pressure reading of less than 130/80 mmHg is the goal. Cholesterol. A lipid profile blood test should be checked once a year. This includes total cholesterol, triglycerides, LDL and HDL. The total cholesterol should be less than 200 mg/dL, the LDL (known as the bad cholesterol) should be less than 100 mg/dL and the HDL (known as the good cholesterol) should be greater than 40 mg/dL for men and greater than 50 mg/dL for women. Eye Exam. A dilated eye exam should be done every year by an optometrist or ophthalmologist (an eye doctor who specializes in eye diseases). During a dilated eye exam, eye drops are used to make the pupil (the black part of the eye) bigger. This allows the eye doctor to see the back of the eye. Finding eye problems early and getting treatment right away will help prevent more serious problems later on. Foot Exam. It is important that people with diabetes take off their shoes and socks at every doctor’s visit and learn how to check their feet daily for cuts, breaks in the skin, or ingrown toenails. The doctor also needs to know if there are any changes in the color or shape of the feet, or if there is any pain or lack of sensation. Kidney Test. People with diabetes need to have a blood or urine test ordered by their doctor every year to check how well their kidneys are working. Flu Shot. A flu shot should be given once every year. A doctor or health care provider may also order a pneumonia shot. Dental Exam. It is important that people with diabetes have their teeth and gums checked every six months. People with type 1 diabetes must use insulin. Some people with type 2 diabetes can manage their diabetes with healthy eating and exercise. However, your doctor may need to also prescribe oral medications (pills) and/or insulin to help you meet your target blood glucose levels. There are more than 20 types of insulin sold in the United States. These insulin’s differ in how they are made, how they work in the body, and how much they cost. You should discuss with your doctor to gain an understanding of what the right type of insulin he/she recommends for your health. When the body cannot make enough insulin, you can take insulin by injection or through use of an insulin pump, depending on how quickly they work, when they peak, and how long they last. Insulin is available in different strengths; the most common is U-100. Oral Medications What Are My Options? Many options are available and your clinician can choose amongst them. Be it with insulin, or with oral medication, if they decrease the serum level of glucose too much it may cause symptoms of hypoglycemia. Some of these symptoms may be confounded with the symptoms of menopause (nervousness, palpitations, sweating, irritability, to name a few).